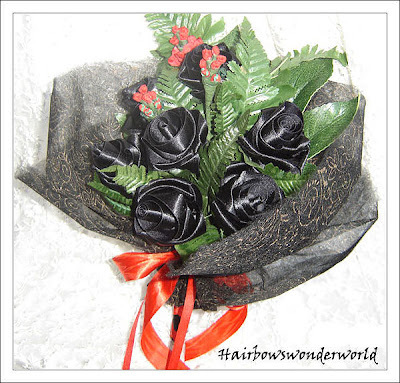 hairbowswonderworld: WHY BUY WEDDING FLOWERS @ HAIRBOWSWONDERWORLD'S? ♥♥♥ I am currently carrying a new direction in my shop : WEDDING FLOWERS and WEDDING RELATED ACCESORIES. 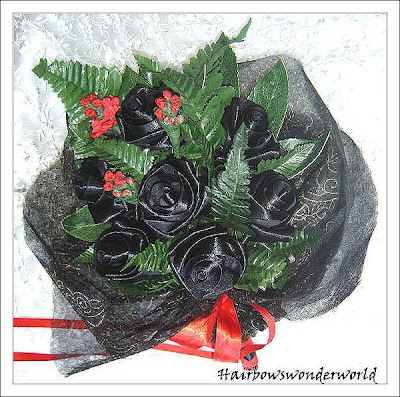 You may want to ask WHY BUY BRIDAL BOUQUET @ Hairbowswonderworld? *You will own a bouquet that keeps for a life time and beyond, which can be perfect to pass along to the future darling daughter at a fraction of the cost of a fresh one. MAKE every flower from scratch. My flowers are made of quality ribbon, with my hands, there are actual work, effort and LOTS OF LOVE put into EVERY SINGLE FLOWER. 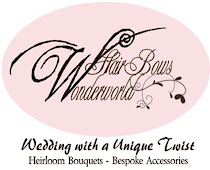 *Buy wedding flowers @hairbowswonderworld's, you'll receive ONE-OF-A-KIND item for your ONE-OF-A-KIND, SPECIAL WEDDING. I have some sample bridal bouquets listed in my shop at a SALE price and I am continuing to list some more sample bouquets soon. However I would love to do custom order. You can always create a bouquet for yourself and I will bring it to life. At the time being you can choose any arrangement of the following flowers, ALL MADE OF RIBBON : ROSE, LILY,LILAC, CALA LILY, DAFFODIL, ANTHURIUM, HYDRANGEA, STEPHANOTIS, ORCHID, HIBISCUS, DAHLIA, PEONY in your colour scheme and with the size you want. Symply convo me to discuss possibilities.